Have you ever visited a friend’s house or a coffee shop and wanted to join the local WiFi network, but didn’t know the password? Or were you on the other side of that equation, with friends or customers constantly asking for the info to join your network? An app called InstaWifi is looking to fix those problems. By taking advantage of both NFC and QR technology, this app can be used by anyone with an Android smartphone. 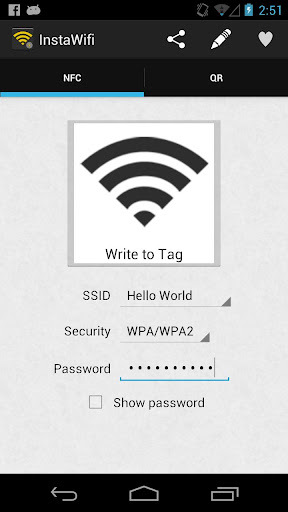 With an NFC-enabled phone, you can choose to write to an NFC tag with this app, so that future visitors with other NFC phones can simply tap to connect. You can also tap your phone to another NFC phone to allow your friends or visitors to join in an instant. 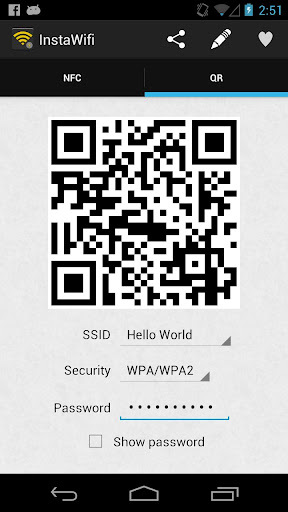 If your visitors or friends do not have an NFC-enabled phone, this app also allows for QR code WiFi network joining. While in InstaWifi, you have 1 tab for NFC activities and another that will generate a QR code for you. All it takes from there is a QR scanning app to glance over your code and your network can be joined. There are other apps that can produce similar activities to this, one being Samsung’s TecTiles. We tend to like the idea of InstaWifi though, since it is much more focused on one feature, joining wireless networks. It’s free, so feel free to give it a spin.